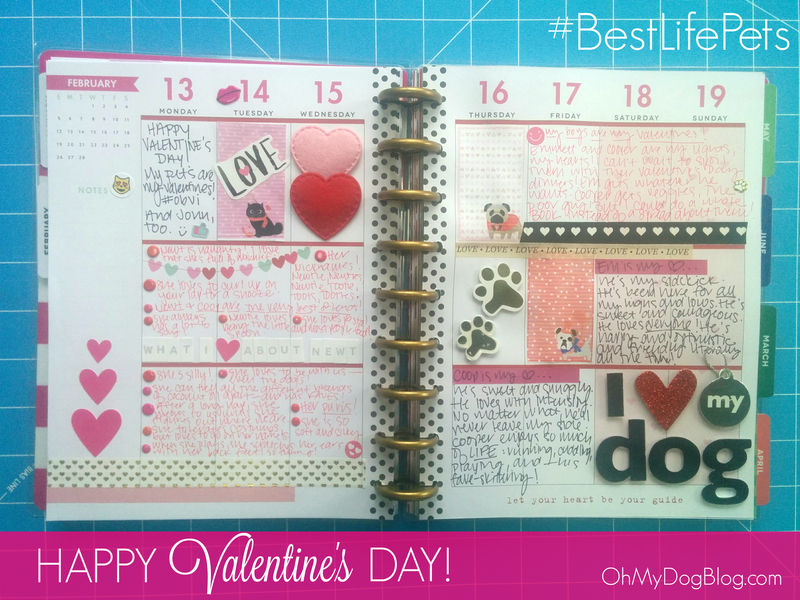 Best Life Pet Planner Archives - Oh My Dog! I think I’ve finally got a handle on… well, stuff. I mean, not entirely. But mostly. Or, partly anyway. It’s been a tumultuous couple of months around here. But I have found after all we’ve been through over the years, the craziest times serve as a hard reset to my priorities. When things are out of control, you figure out what’s important to force into control. For me, it’s family, number one. What does that look like right now? Well, when Violet came along, I hadn’t actually been in my full-time job with BlogPaws for long enough to qualify for FMLA. Yes, I could’ve taken unpaid time off, but that wasn’t realistic. We were so lucky that John’s job is super flexible AND he had a ton of leave saved up. So, for the past 7 weeks, John’s been Violet’s primary caregiver. Plus, his stuff is super project-based instead of office-hours based, so if he ends up working at night for a while, it is what it is. When he’s had meetings and things, I’ve just gotten up extra early (Vi’s up by 5 anyway, so nbd!) to get ahead on work so that I could take care of her while he was on his calls. We’re figuring it out. Some days it flows. Other days… not so much. What we weren’t willing to sacrifice in all that figuring-it-out was family time. So, just about every day, we’ve found time to take Violet and Cooper to the park. We’ve taken her hiking every single weekend since we brought her home. If I can get away for a lunch break, we latch her car seat into a jogging stroller and dash around the block with them. We don’t want to be those people whose life stops “because of” a baby because we want her to experience a fun, full life… And we desperately need to keep Coop’s world happy and enriched while he’s still trying to figure out the loss of Em. To make totally sure that all that family time can happen, I have to be crazy careful with my time management. That has been my big struggle because I suffer from Something Shiny Syndrome (aka, SQUIRREL!). She sometimes drops back off to sleep… usually not. On the day she does, I can get a head start on BlogPaws work. On the days she doesn’t, I snuggle her and Cooper while sipping my coffee. It’s actually pretty lovely. Then it’s work, work, work with a lunch break to walk or jog with my babies, then back to work. On the days that I start around 5, I’m trying to finish around 3:30 or 4 so that I can work on other projects or my blog (I’m aiming for… and OK with… one post per week for now… but striving to work towards two). But no matter what I’m working on, I really, really, really force myself to be done by 5. The past few weeks, that was impossible as we worked toward the conference. Now that I’m back home, I’m going to reinforce and stick to those hours so that evenings can be cooking out or swimming (the pool’s opening soon!) or reading to and playing with Violet and Cooper. John. OMG, he’s such an incredible house Frau. He’s amazing with Violet and keeps things running, bottles washed, diapers changed, etc. My planner. It is legitimately the other half of my brain. Cooper’s and Newt’s vet appointments and medication refill reminders, Violet’s doctor’s appointments, work to dos, house to dos, shopping lists, blog posts, John’s meetings that I need to be free for childcare, deadlines, bills due, social obligations, all of it… If it’s not written down, it’s not happening. It might as well not exist. Which brings me to the ultimate point of this post (“Wait, she has a point?!?! ?”) and my lovely friend Jodi of the fabulous blog, Kol’s Notes. She made the cutest, most wonderful pet-themed planner stickers EVERRRRR. Jodi shared the social media stickers. And here’s the link to download the blog stickers. These save me the time from writing out these headers, while making my functional planner extra cute. Plus, seriously, THE HAMSTER. BTW: If you don’t have sticker paper, do what I do. Print it out on regular old computer paper, cut, and glue. It looks just as cute but without the added expense. So, there you have it! A glimpse at the mess around here 😉 along with my plans to keep it someone shoved into a neat pile. That’s about all that’s been going on around here! More on BlogPaws soon, along with some other glimpses into what life is like these days with the myriad changes from the past few months. How are you guys?? What’s new? I sure hope all’s well! I’d wager a fortune in kibble that the answer is: never. Never has any one of us ever said that. I don’t think anyone–except maybe an elementary school kid on summer break–feels like there’s endless time stretching out ahead. There are trails to hike and tricks to train and books to read, not to mention… you know, work to do. Chores around the house take up time, too, but I’ve always felt like they take away time from all that other stuff. But, the truth is that pets are kinda gross. They drool. They hack stuff up. They track in stuff on their feet and kick litter out of the box. Cleaning is a necessity, and pet-loving people have a few more cleaning chores to do than those who live a lonely pet-less existence. And I’m not just talking about sweeping up fur, but also water drips from around the bowl and sanitizing disgusting toys and washing their food and water dishes and bedding, and the list goes on! So, what’s a busy person to do? You can hire a house cleaner! (So jealous if you do!!) Or, you can do what I’ve done: Break household tasks down into itty bitty bites that take only minutes a day rather than whole chunks of time. One caveat: This method requires you be OK with a dose of imperfection. I rely entirely on routines. Daily routines that take care of the basics, weekly routines that clean up the gross accumulations, and then longer-term routines for monthly and quarterly tasks. For instance, we try to deep clean our carpets with a rented carpet cleaner quarterly. Between yard feet and litter box feet, it has to happen, but it’s too big of a job–time consuming, anyway–to do more often than that. Picking up poop from the yard and scooping the litter box, though, those are daily cores. The other big piece of all this, especially when you have a house full of animals, is the clutter/picking up issue. I contend that the less stuff you have, the less stuff you have to clean! So, regular de-cluttering is hugely important. A nightly pickup–even like five or 10 minutes–can keep the majority of the mess totally under control. Sure, there’s going to be dust and fur floating around… but there’s where the embracing imperfection part comes into play! That, and a weekly vacuum. Trust me on this method!! If you spend 10 minutes a day tidying up, that’s like getting back a full 70 minutes of your beautiful Saturday. Then you can use that time however you like… driving to a new hiking spot or cracking the cover on a good book are high on my list. There’s my spring cleaning routine, which is pretty much the same as my regular routine with the exception of adding in those quarterly tasks. But I’m always looking to improve! How do you stay on top of your household chores? Or do you wait until one big clean, like in the spring or fall, to truly tackle it all? What do you think of the checklists? If you’d like to see how Jodi uses hers and manages her cleaning routine–a million percent better than I do–she’ll be sharing her routine on Kol’s Notes. I found my happy place. 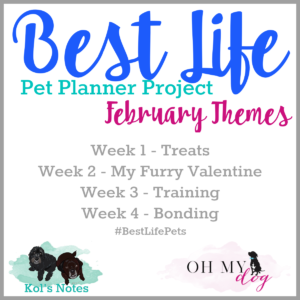 Over the past couple weekends, working on this #BestLifePets planner with an audiobook playing in the background (currently: Everyone Brave is Forgiven)… It’s totally relaxing and seriously fun! The things I’m capturing are things that, a year from now–heck, probably even a month from now–are things I wouldn’t remember because they’re so small, but I’m SO grateful to have a place to capture them now. For instance, the other night we ordered dinner from a pizza place. I spotted on the menu single slices (who knew? ), so I ordered Em a single slice of pepperoni pizza. He LOVED it, of course. And so I wrote about that in that week’s spread. Same thing with the silly little things that Cooper does on a day-to-day basis. I now have a spot to chronicle the funny moments that wouldn’t necessarily stick in my memory. I think it’s going to be so fun to flip through this book down the line! I’ve also loved seeing all the projects YOU are working on. So inspiring! 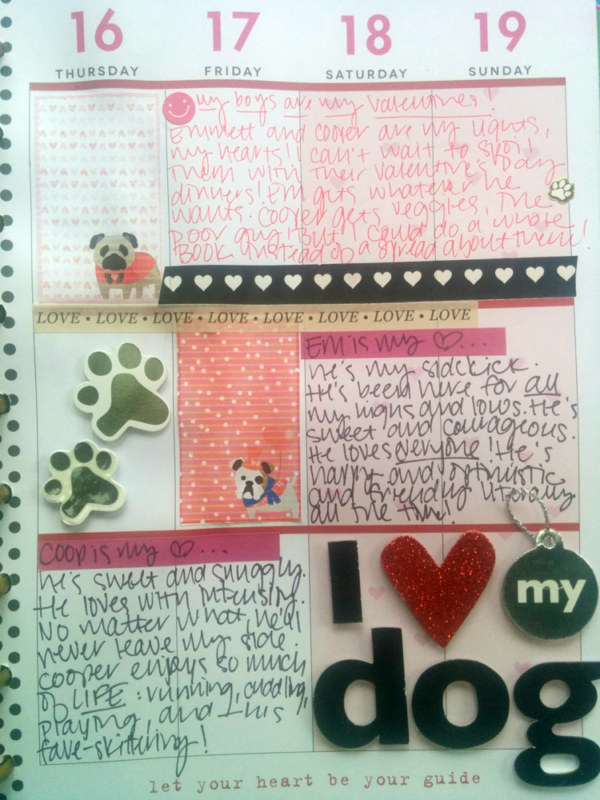 I love how everyone has a fresh take on creating the pet planner or, like mine, the memory book. I have seen comments on Instagram from folks who say they aren’t sure about taking it on because they’re not creative. I wrote a little rant about that on the BlogPaws blog, actually, because I truly believer everyone is creative. Everyone can create. It’s just that “creative” somehow implies artistic ability, when that is only a small sliver of types of creativity. If you look at my spreads, you’ll see that I use mostly stickers (no drawing AT ALL) along with journaling. All that said, I wanted to share with you some stickers to help in your creative efforts. Jodi, the brilliant, creative genius behind Kol’s Notes and this project designed Valentine’s Day stickers–for cats and dogs! They are super cute and helpful for decorating your pages. Here are the cat stickers! And here are the dog stickers! A mix of pasted-down printable stickers, puffy stickers, and journaling! Complete with messy handwriting and un-lined-up washi tape! 🙂 As I said, it’s all about fun, not perfection!! What do you guys think? Are you taking part in the challenge? How are you using your planner, if so? What question do you have about putting together a fun memory keeper like this? And–the big question–are your pets YOUR valentines? I’m awfully glad we’re good friends at this point because I’m about to unveil some new crazy I haven’t shared with you guys before. I need a schedule with a list every single day because, honestly, I suffer from something-shiny syndrome. Unless I have focus, I find myself… staring out the window… starting laundry… grooming Cooper… squirrel! That hot pink binder above? That’s my daily work planner. Everything lives in there: schedule, projects, tasks, reminders, everything. The brown notebook at the top? That’s a loose-goosey journal. I write constantly to get things out of my head and onto paper, and it all goes there. Without those two notebooks together, I’d have no idea what to do. My brain holds nothing. It’s all in those two books. But! Today I’m sharing the newest addition to my planner love, that disc-bound one on the bottom of the pile for a big, huge, fun, year-long project! Announcing the 2017 Best Life Pet Planner Challenge! What does it mean to you to live your “best life”? If I had to guess… I’d predict that pets make up a big part of your best life! They’re such a huge part of mine, and when you combine that with my love for planning and journaling, you get THIS exact project! There’s really no right way to do this project! You’re finding your own unique way to capture a year in the life of your pets. It’s whatever YOU want it to be! Here’s what you need: any kind of notebook/calendar/planner and some pens or pencils or markers. That’s the minimum, and you can get through the whole year with just that–a notebook and a pen! For Jodi and I, we’re using The Happy Planner, which is available Michael’s. I also bought a couple extra goodies when I was picking it up… as you can see in the pic above, I got a big pack of stickers to go with it, along with a Sharpie and a stencil. Pictured above is last week’s spread. It’s a mix of stuff… some thoughts about a blog post I was working on, along with some tracking info for Em’s appointments, and journaling about the weather and Cooper’s behavior. I used a fun little tip-in with the “winter is coming” scrapbook card I happened upon that I taped down to journal under. I’m not super artistic, but my goal for this project is to approach it as a scrapbook/memory book/tracker for the herd. I’m NOT using it as a planner (see my crazy above), so it’s going to be a just-for-fun thing that I can look back on and remember all their silliness. I’ll have tons more details as I work through this each week. I’m a week behind, so this week’s theme was supposed to be resolutions. 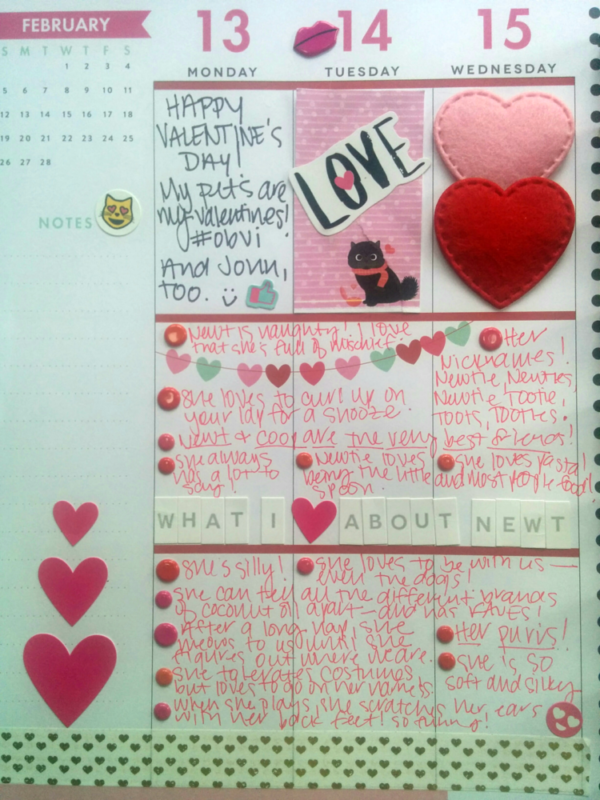 I actually did those in my planner last week, shown above. Jodi shared the launch of the challenge here and a darling free printable sticker set here. Definitely go check out that first post at the minimum for a far clearer explanation of the project than what I was able to write here. 🙂 She also created themes for each week that are totally optional. However, there’s no falling behind, no feeling overwhelmed, or anything like that. If you want to follow the themes, great! If not, also great! This is a fun, creative, do-what-you-want-when-you-want project. There’s no right (or wrong) way to create!